The following article is an excerpt from my book on various aspects of audio production. The excerpt specifically deals with the planning and the reality of an extended location recording trip. The trip in question was part of the overall process of creating The Aviation Collection sound effects library. The following section is a detailed account of a recording trip I did in early 2011. This trip highlights the wide range of situations, challenges and potential issues you might encounter when planning location recording trips. Often it does not matter how much you prepare or how often you have done similar trips, things will go wrong, things will break or malfunction and you will need to adapt, adjust and replan on the fly. This is not really very different from many other types of jobs, it’s just that with location recording you often only get one chance to capture the things you are after. While I was gathering material for The Aviation Collection (TAC) I spent a lot of time visiting air force museums and other aircraft collections. My long association with these organizations gave me early insight into upcoming events and opportunities to record interesting new material. One incredibly fortunate coincidence was that the year I focused the most on TAC also happened to be the 90th Anniversary of the Royal Australian Air Force. As a result there were some major events planned for that year, one of which involved over 60 classic aircraft flying to four major locations over the course of a week. This was quite literally a chance of a lifetime to capture a huge amount of material in a very short time, but it would also take a considerable amount of planning and preparation. The first stage of getting ready for this event was to gain permission to get the access I would need to capture the sounds I wanted. I had already established a good working relationship with some of the organizers and so this was relatively easy to negotiate. I also offered to help out in any way I could and supplied some audio material for one of the events. Although this seems straightforward on paper, the reality was that I only got to this position after many months of developing a good relationship with a variety of people in different positions both in Victoria and NSW, so these “easy” negotiations were preceded by months of good ground work. Once I had received confirmation that I could attend record and interact with pilots and aircraft at the event, I needed to work out a priority list of what it was I wanted to record. Although the list of attending aircraft altered many times as I created a schedule, I was able to make a general plan based on the overall selection. . I had already recorded material from some of the museum planes that would be flying and I knew I would be able to gain access to them again in the future, so I made a point of identifying any aircraft that were new or unusual to me and flagged those as primary targets. I also flagged military aircraft over civilian aircraft as that was more the focus of the library I was creating. Since this was to be a solo trip, I needed to organize every piece of equipment, work out how I was going to operate it and plan a general strategy for each day. A general concept of your actions is often better than trying to plan details as things will always change and flexibility is vital. My main goal was to record the sounds of as many aircraft as possible in as many ways as possible for each day of the event. Just to complicate things I also wanted to try and capture as much video and still footage as I possibly could at the same time. This meant I would spend most days loaded up like a pack horse. My previous day trips to record aircraft often involved using multiple devices. My secondary device is a small portable digital recorder I would give to the pilots to carry in their pockets. As I have mentioned in previous chapters the usefulness of the material I managed to capture was always worth having one of these on me. For the air pageant I decided to carry several of these devices so I could hand out more than one at a time. Some people have asked why I spread my focus to trying to capture video and still images as well as sounds, asking if it is necessary and does it interfere with the sound recording. To answer the second question first, yes, sometimes it does interfere with the sound recording, but is it necessary? Also yes. By choosing to run your own business or create your own material, you have also chosen to be your own accountant, business leader and marketing manager. Branding and marketing yourself is something that is covered in other chapters of the book, but capturing visual material of what you are doing is important for archiving, identification of the sound sources and for creating marketing material for yourself. Closer to the date, I had an information sheet of who was flying what and at what time. Although I knew the timing was likely to change, the match up of pilot to aircraft was likely to remain accurate. I made sure I numbered my devices and when I gave one to a pilot I planned to note down which device was with which pilot. This would ensure I could accurately identify the recordings at a later date (and keep track of all of my devices). These small handheld devices allowed me to record material I would never have otherwise been able to capture. They were inexpensive, easy to operate and a critical component of creating a library with rare and interesting content. I have been asked why I would consider a small inexpensive digital recorder to be suitable equipment to capture material for a high end sound library and this poses the question “What is the best piece of equipment for a job?” The answer to that is simple; the one that gets the job done. Generally I might have a few minutes to approach a pilot, explain what I was doing and make a request for them to take a small device and put it in their pocket for the duration of the flight. This was usually met with little or no resistance because it was a simple request that was easy to help out with. In general I have found the pilots I have met they have been some of the nicest, most helpful people I have ever encountered; maybe it has something to do with being able to fly with the birds. The point being that it was not a big deal for a pilot to pocket a small device. If, however, I had asked if I could install a major piece of equipment into their cockpit that would require an hour of preparation and a series of mounts to be attached to the aircraft for safety and operational reasons you can probably guess what sort of response I would have received. While I am certainly not going to claim that the material captured on the portable devices internal microphones could possibly compete with close to $10,000 of equipment I normally carry around, I will quite confidently state that I am one of the few people who has ever captured recordings from the inside of many of these aircraft and that those recordings are excellent examples of the experience. So it kind of comes down to, do you want a super high quality recording of nothing, or a slightly less high quality recording of some great material? To reiterate, the best piece of equipment is the one that allows you to capture the material you need. Another tool I had successfully used in previous day trips was self-sufficient remote recording kits. Generally these are made up of one or two microphones mounted in a blimp cover, attached to a standard camera tripod. The mics are connected to another set of small digital recording devices. The devices had large SD memory cards in them and long lasting batteries to allow for many hours of continuous operation. You simply set them up, switch them on and forget about them until the end of the day. The beauty of recording at an airfield is that there is little variation on where the planes will take off and land. By positioning these devices at the end of a runway or at the apex of where two runways met, I could pretty much guarantee that every single plane that took off or landed on the day would fly directly over the mics. Having two sets of gear in two different locations on the airfield meant that every time a single plane took off or landed I would capture sounds from two different perspectives. The equipment I was carrying personally provided a third perspective and the tiny devices in the pockets of some of the pilots a fourth. This greatly increased the efficiency of gathering material and allowed me to single-handedly capture as much material as a small team could have. More importantly, the remote rigs could capture material that no person could ever have. No airfield would ever allow a person to stand at the very end of a runway with planes passing barely overhead, this would breach many air safety regulations. But a small, low profile remote recording rig was an acceptable compromise. Sometimes the best solution is not to just add more people to a team. So each morning my day would start by making my way out to both ends of the airfield, setting up my remote recording units, testing the levels and setting them to record. 7 hours later I would do the whole thing again in reverse. Obviously under these conditions it is critical to get your recording levels right as you have no way to change them once the planes start to fly. This is again where the split input level setup described in an earlier chapter is a critical aspect of capturing a wide range of material. The final set of equipment was the rig I was carrying personally. This is my main set of equipment, the highest quality gear I own and was configured to allow me to get where I needed to get as quickly and quietly as possible. 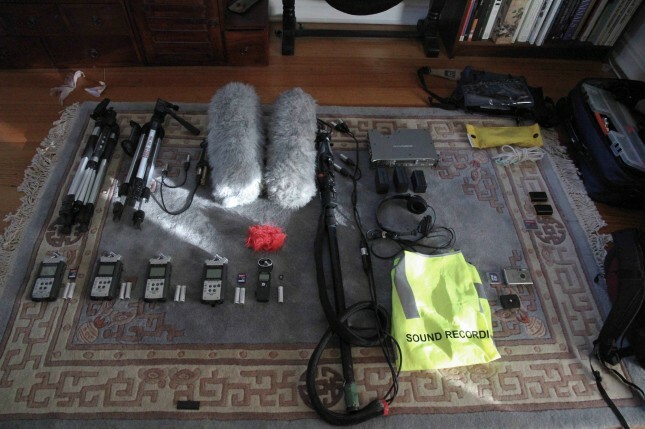 My personal rig included; a Sound Devices digital recorder, a high end DSLR camera, a boom pole with a blimp containing two microphones as well as extra batteries, memory cards and portable recorders. The overall effect was that I was weighed down like a soldier ready to go into combat and was nearly as heavy. This was going to be hard work. Before stepping out of the hotel, my first task was to ensure all memory cards and hard drives were clear, freshly formatted and that all rechargeable batteries were fully charged. For the remote rigs I was using long lasting commercial batteries. Even though these were an additional cost I find that the rechargeable batteries can’t get over 4 hours of use, especially when suppling phantom power to microphones. Under normal circumstances I use rechargeable batteries for everything, but a full day is just that little bit too much for them. I had extra batteries for both my main recording device and my DSLR Camera on me, enough for both devices to run all day. I checked leads, connectors and all functions of the equipment to make sure everything was working. Each evening after returning from a day’s recording the first thing I did was plug in all units to recharge, remove batteries and place them in charges, and make sure I lay out all the batteries that need charging so I don’t get them mixed up. Forgetting to recharge a battery can be disastrous if you go out the next day with not enough power for a full day. Next, I would then go through all my devices and memory cards and transfer the data onto my laptop. The 788T holds over 40 hours of material, so I would not delete anything from this until the entire trip was over, but I still backed everything up onto laptop just in case. The SD cards needed to be transferred and cleared ready for the next day’s use. One of the issues I encountered with this system is that many batteries can take a long time to recharge. Most days I had to wake up at 3am to swap over batteries on my 788T to ensure they all charged. I have since purchased a separate charger that charges 2 batteries at once. This means that between the unit and the charger I can recharge three batteries without needing a changeover, I get more sleep this way. Transferring the data onto computer can also take many hours, so I time it so I can sneak out for dinner while data transfers, put some on overnight and even finish off the last few the next morning over breakfast. Recording trips such as this do not leave much time for anything else as pre and post recording duties take a lot of time. When I am actually on location there are a multitude of things that divide my attention. Overall, my primary goal is to identify potential sound sources and get myself to where I can record them. Now let me demonstrate an average day on this trip. I arrive at the airfield, my remote rigs are setup, I have my gear primed, switched on and pre-record is activated. Then I wait. This could be couple of minutes, ten minutes, or even hours. On the first day the wait was on the long side because I made sure I arrived the day before the event officially started. Many of the planes would be arriving that day, taking the opportunity to go for a joy ride, compare their planes with other pilots, do last minute checks and generally do things that made noise. But no one knew when or where the planes would be coming in. So I waited. Given the random schedule on this day, as soon as I spotted or heard a plane, I would need to try and identify it as quickly as possible, either visually if I recognised it, by the sound of the plane, or simply asking a helpful enthusiast. Next, I would get my gear recording and make sure I was well away from anyone else making noise. I would speak into my microphone with whatever identification info I had and indicate what the time was. All of this was essential because I had two remote rigs out on the runway capturing everything that flew in and I would have over 60 aircraft likely to fly over them in the next few hours, so ID and timing of sounds was critical to be able to sync all the data for each sound later on. Some of the pilots were very helpful and performed a low pass of the airfield prior to landing; giving me some great flyover recording as well as allowing for positive ID of the aircraft. As the planes touched down I would position myself on the edge of the runway and capture the landing, I would then reposition to try and capture some of the taxiing, but also be close enough to record the plane shutting down. Essentially my job was to be agile and capture as much material as possible while the remote rigs captured good takeoff, landing and flyover material. As the day progressed I tried to be aware of pilots prepping their aircraft to go up again. If I noticed this in time I could reposition to record a good clean start-up of the plane and more material while they went through pre-flight. I even managed to get a couple of pilots to take portable recorders with them to capture some cockpit sounds. As the number of planes on the ground increased, there was no way I could be everywhere at once, so as always I deferred to those planes that I really wanted to capture. Of course at all times while doing this I was taking video and still footage. Often the still photos were taken in the lulls between incoming and outgoing craft so this worked well. Just when things are going swimmingly, Murphy ’s Law sneaks up from behind. I could stand and wait with nothing happening and then all at the same time a new plane would fly in, someone on the ground would start up and someone else would be working on their engine. This meant contamination of sound sources was a constant challenge. The best I could do was to be aware of what was happening, and respond quickly to reposition myself to minimize unwanted sources. Any time spent out in the field for hours on end is going to tax both your concentration and your physical stamina; in hot or cold weather this can be particularly difficult. Mental and physical tiredness can not only be frustrating but also very dangerous, especially around aircraft or other heavy machinery. Because of this I place safety on a much higher level of importance than anything else. I have been lucky enough to have never had an issue with injury or serious equipment damage while on location, but I have not been so lucky with equipment or mental failures. I always wear a bright reflective vest and by establishing a good relationship with the airfield personnel it means they know me and they know what I am doing. I went so far as to tell them “If it looks like I am doing something stupid or going somewhere I shouldn’t then just yell at me.” I needed them to feel comfortable that I would act without hesitation if they needed me to do something, not just to keep them happy, but to keep me alive. When it comes to audio equipment, you really do get what you pay for. One of the remote rigs I was using had some brand new SD memory cards in it. These were a brand I had purchased overseas and they were high capacity and high speed. I had never before had any issues with memory cards and so I inserted them and used them exactly as I always had. At the end of the first day when downloading the material I discovered the card had only captured about 2 hours of material. When I checked the device it displayed the card full message, what had gone wrong? I did a range of tests with the device and the card and found that it did indeed only want to record 2 hours of material, I tried several times and had the same problem. Finally I fully reformatted the card and from then on they functioned as per normal. I have no idea if the card had been incorrectly formatted by the manufacturer or what else might have caused the problem, regardless it meant that I missed hours of material from where that mic was located. An important lesson on not only purchasing equipment you know works well, but also on testing anything new before you really need it. This is where pre-planning and anticipating challenges worked out. I had two mics and two devices as part of each remote rig, so while I was limited in the variation from this rig I still captured everything that flew over. Call me over cautious, but I will ALWAYS try to cover myself for things such as this going wrong. Since this time I have not had any further issues with these cards and as you might expect I now reformat every new card. The second main challenge for me was just one of concentration and focus. Working long days, out in the elements, carrying a heavy rig is exhausting, not to mention the mental attention required to be ready for anything. Unfortunately, tiredness did get the better of me in one instance. One of the planes that flew in was a beautifully restored Douglas DC3 twin engine propeller passenger plane. The DC3 has a wonderful and iconic sound and I was delighted by the chance to capture some material. I spoke to the crew and they told me they planned on doing some training that day and were going to be flying around doing takeoff and landing practises. I asked if they would be prepared to have a portable recorder inside the plane and they were happy to accommodate me. By this stage I had been on my feet for about 5 hours and was getting pretty tired. I handed them one of my portable recorders, checked that the levels were ok and went off to record the DC3 taking off. For over an hour the DC3 flew around and between myself and the 2 remote rigs I captured heaps of excellent material. However when the plane landed and I got my portable device back I realized my error. Most devices have two stages of recording function. The first button press will arm the record function and indicate the input levels so you can set them to capture your sounds correctly. You then must press the button a second time to actually start the device recording. At this point the counter will start to count and the device is actually capturing sound. In my haste to give the crew the device I had looked to check the input levels, but NOT switched it to record. I had missed out on capturing over an hour of DC3 take-off and landing sounds from inside the plane. This was quite literally a chance of a lifetime missed. I found a small remote spot of the airfield and spent a good ten minutes swearing like a sailor at myself. All the achievements of the day had been overshadowed by such a basic beginner mistake. Even after many years experience of recording out in the field simple errors can get the better of you. My tiredness was a contributing factor to missing the DC3 recording. Tiredness can show up in other ways as well. After 4-5 hours of being on your feet running around with heavy gear, your muscles start to ache, you are more prone to shifting your weight from foot to foot. The issue with this is that sometimes that will generate unwanted noise. On many of my days I can always tell the recordings captured later in the day, I can hear more cases of clothing rustling or foot movement vibrations. It does not matter how often you chastise yourself for this or remember that it is a factor you need to be aware of being incredibly tired is very difficult to overcome and allow yourself to focus. For this treason you should always be aware that the material planned for the end of the day risks having errors introduced. The exhaustion factor was demonstrated again later in the trip. I was fortunate enough that the airfield being used for the Air Pageant was located in remote country NSW, about 7 hours north of Melbourne or 5 hours south of Sydney. While inconvenient to get to it did however mean that apart from the weather most of the time I was recording in what was an almost perfect location. There were very few other sounds to get in the way if only a single aircraft was flying. This meant I was fortunate enough to be able to record an aircraft flyby that was practically silent at the beginning to the full pass over and then off to silent again. A plane flying from horizon to horizon however can take a good few minutes and trying to stand completely unmoving for that time after a long day in the sun can be tricky, so although a plane flying over is very loud at the point just above your head I needed to remain focused through the entire time it was audible so as not to introduce unwanted bump or scrape sounds to the recording. This was more and more difficult as the day wore on and exhaustion set in. Operating solo means there is no one to cover for you if you need to use the bathroom, or need to grab a drink or some food. On one hand, you risk missing something unpredictable, unplanned and wonderful occurring at exactly the point when you are away from the action; on the other making sure you are fed and watered is critical to avoiding exhaustion becoming so bad that everything you do capture is unusable. There is a balance you need to achieve when working solo. Oh and going out drinking at the end of the day is a really bad idea, because a hangover the next day is probably about as helpful as not turning up at all. Any recording trip can have issues like those I have listed above. Nonetheless, there was far more that went right with this trip than went wrong. Over the course of five days I was exposed to a higher density of aircraft sounds than I had been over the previous six months of weekend trips to airshows and displays. The sheer number of planes present meant that there was always something to capture. Not every second was a perfect example of a clean and clear recording, but the fact that there were often multiple planes taking off in sequence or even launching together made for some incredible material to record. The biggest benefit of this entire event for me was that it was not a public event. There were certainly a lot of people around as you would expect with over sixty aircraft, but the event was not an air show designed for a public audience. There was no audience, no PA system and as a result no awful rock music playing throughout the day. This alone reduced the sort of sound contamination I normally encounter at public events by about 80%. The people who were there were aircraft enthusiasts and in most cases this meant they were understanding and respectful of what I was trying to achieve. Enthusiast groups are often the best groups to work with as they often share a similar interest in the material and will usually realize you want the least amount of background noise as possible. The lack of general public also allowed the organizers to provide better access to those of us on the tarmac. Most attendees were well aware of the danger of operating around aircraft and so everyone not only had a good sense of respect for the machinery but they were also actively looking out for each other. This allowed me to freely move among the aircraft and stand at the wingtips of many planes as they started up. The wind down of a Sabre Jet turbine after shutdown quite literally needs the microphone in the air intake to capture. The real success of the entire week was the two remote recording rigs. Because of the size of many of the airfields, they were literally miles away from the staging area and people. This meant I could capture pristine recordings of aircraft flying overhead at takeoff and landing with at most the occasional bird or insect call in the mix. For future such events I would be tempted to take half a dozen such rigs and position them all around the area much like sports events do. Once setup correctly this process is a brilliant way of capturing extra material. The in-cockpit recorders carried by the pilots all worked beautifully. I have found that out of dozens of planes recorded in this way the only one that didn’t work was because I underestimated how loud the plane would be and set the levels too high. The positioning of the recorders in the leg pocket of the pilot’s flight suit worked perfectly. The material of the suit did not interfere with the sound capture at all and while flying, the pilot’s leg movement almost never produced any extra sound. I had a couple of pilots concerned that I would capture them swearing, but I pointed out that the extremely high volume level of the plane meant that I needed to set the input levels on the device so low that it would not pick up anything other than the engine sound. Something else that should not be overlooked is simply how much I learnt over the course of the trip. There was some very valuable location recording experience I gained from such an intensive active work period and every time you activate a microphone you are learning something, but I also learnt a huge amount about the history of many of the aircraft, stories of the people who flew them in the various armed conflict and lots of information about aviation in general. This made the entire trip fascinating and rewarding, tiring and wonderful and absolutely worth the effort I put into it. Anyone who knows me knows that I spend a lot of time preaching the wisdom of doing something that you love and even on fairly “ordinary” days when I spend all day sitting behind a computer I get a lot of satisfaction out of what I do with my life, but events such as the air pageant highlight so clearly why I get joy out of the work I do. As a fairly typical boy, I played with a range of toys and dreamed of fighter planes and watched action films and generally enjoyed the typical kinds of things that boys do. As an adult standing in a field with a Spitfire flying directly overhead at maximum speed I found the little boy in me cheering so loud I was almost in tears. I have been extraordinarily lucky to have such close access to some of the most iconic and evocative sounds in our history and it simply encourages me to go out and find more amazing things to point microphones at. I am happy with the thought that I will never run out of things to record. Stephan Schütze has been a composer and sound designer in the games industry for over ten years. His obsession with sound led him to create his own company Sound Librarian that now produces commercial sound effects libraries and educational material for the audio industry worldwide. He is considered one of the world’s leading authorities on the FMOD sound solution for games. Stephan is happiest when pointing microphones at things. This is a great read. Very insightful and informative. Thanks for the post!! cool write up. I just spent a week doing sound at EAA / OshKosh. I was mostly doing interviews…. so go figure that more than once I had a plane stomp on it. that said, the only real problem where helicopters circling around giving rides. I generally got really clean stuff…. but was I missed was carrying an on board recorder ( mixer gig ) for getting the stuff you where getting. no one bothered to tell me they were looking for sfx if you could get them…. and I really wish I’d set up my boom in some sort of stereo setup, even if it was a down and dirty trick I’ve done, putting a lab in at 90 deg to the main mic… one day I’ll go get my self a proper side mic, but the lav trick works and gives a stereo image thats better than nothing… like you say, so days its whatever gets the job done. Feel free to contact me directly for more info as well! Thank you for sharing your experiences and methods. As most sound guys, when we are not recording/mixing etc, we are reading about it. And this was a very enjoyable read. Love the idea of the small portable rigs. Food for thought, that’s for sure. The sounds are fantastic also, and I thoroughly agree that the ends justify the means. The results you have achieved are great. Many a good tip has been taken away from this article.